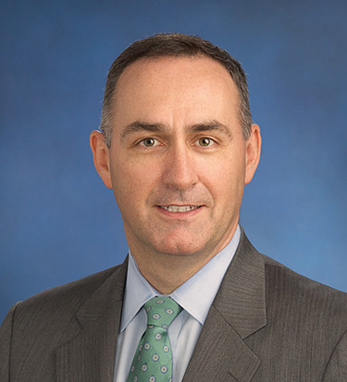 John S. Daly/Goldman, Sachs & Co.
John S. Daly is head of the Americas Equity Capital Markets Group at Goldman Sachs. He joined GS in the Investment Banking Division and has held various positions, including responsibility for Energy and Power transactions in the Equity Capital Markets Group in New York; a three-year period in Hong Kong as co-head of Capital Markets for Asia ex-Japan; and co-head of the Industrial and Natural Resources Financing Group in New York. He became a managing director in 1998 and a partner in 2000. Prior to attending business school he spent four years as an engineer at GE. John earned an M.B.A. from Wharton, a B.A.I. in engineering, and a B.A. in mathematics from Trinity College Dublin. He is a member of Trinity’s Foundation Board, the Trinity School of Business Advisory Board and the Financial Services Advisory Board of Enterprise Ireland. A Clontarf native, he lives in New York City with his wife, Norah, and their four children: Claire, Grace, Jack and Harry.